The catalyst for this list is a recent chocolate spill in a German town that “paved” a road with just over a ton of delicious chocolate. A tank from a nearby chocolate factory ruptured, spilling a river of sweetness down the street. 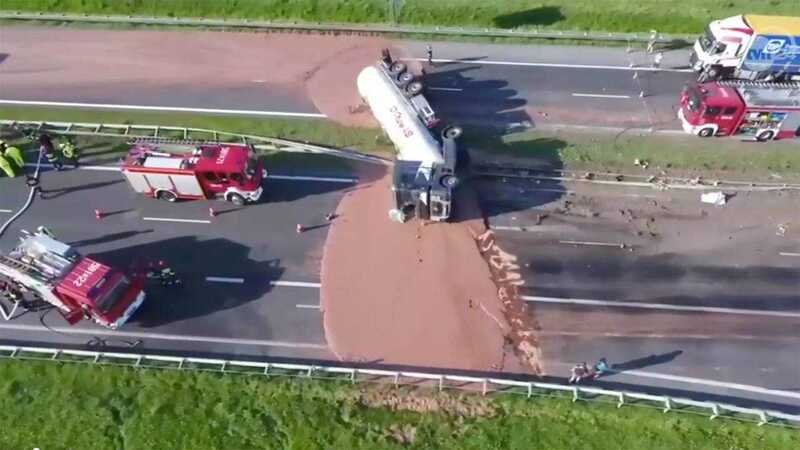 It’s not the first time we’ve seen a chocolate road, however – in May of this year we reported on a truck that overturned on a Polish highway between Warsaw and Poznan (pictured above), dumping 12 tons of chocolate across the road. There were no serious injuries in either chocolate incident. There have been numerous beer spills through the years, including one back in 2017 on a Colorado highway. 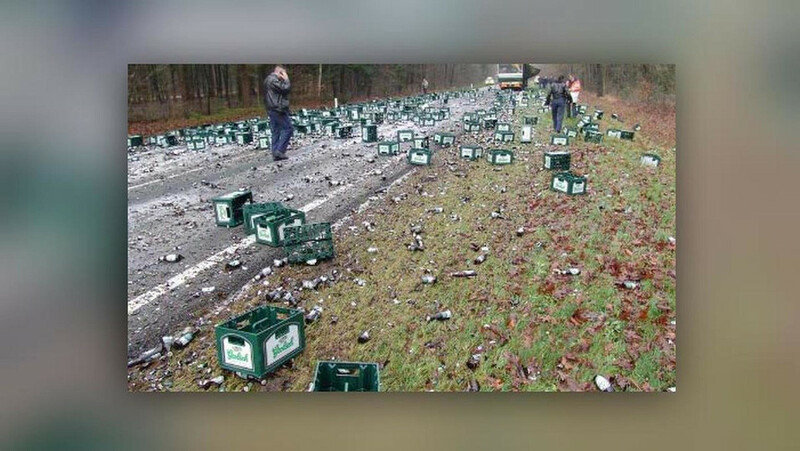 However, we’ll choose this epic spill of over 2,000 cases in the Netherlands for the sheer carnage of glass bottles and foamy brew strewn across the highway. 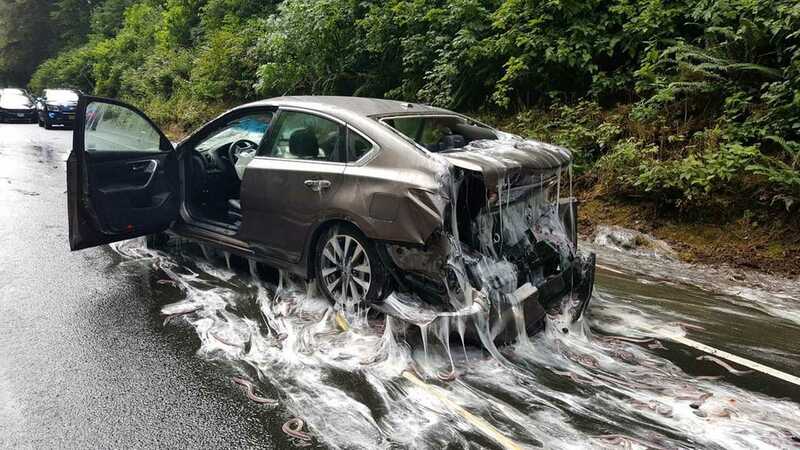 Back in July 2017, a highway in Oregon fell victim to the wrath of a few hundred Pacific hagfish, also known as slime eels. More than 13 containers of slime eels were being transported by a flatbed truck on U.S. Highway 101, when the driver reportedly slammed on his brakes to avoid a construction zone. The Oregon State Police said one of the containers hit a car traveling in the opposite direction, while the rest of the containers spilled off the back. The gross incident caused a four-car pileup and dropped more than 7,500 pounds (3,401 kilograms) of eels on the road. The aforementioned slime eels debacle wins the day for the most disgusting spill we’ve seen, but this takes a close second. 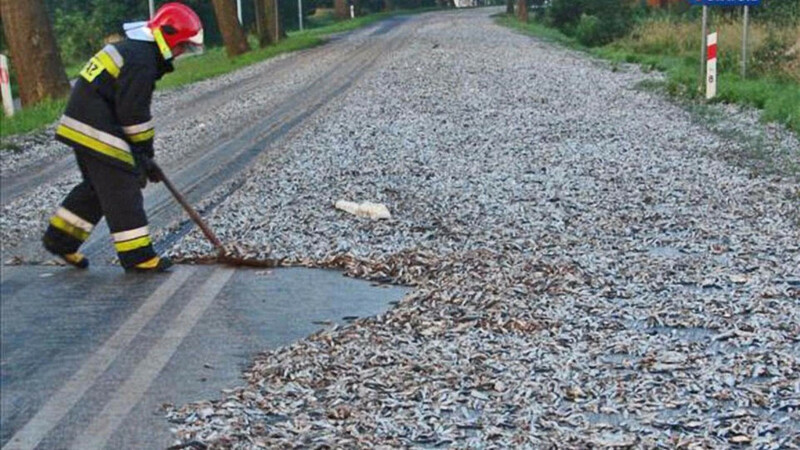 As reported by the Daily Mail, the spill happened in Poland back in 2012 after the driver forgot to close the rear door to the truck, resulting in 24 tons of sardines all over the road. That must’ve smelled amazing. We originally covered this in January 2017. 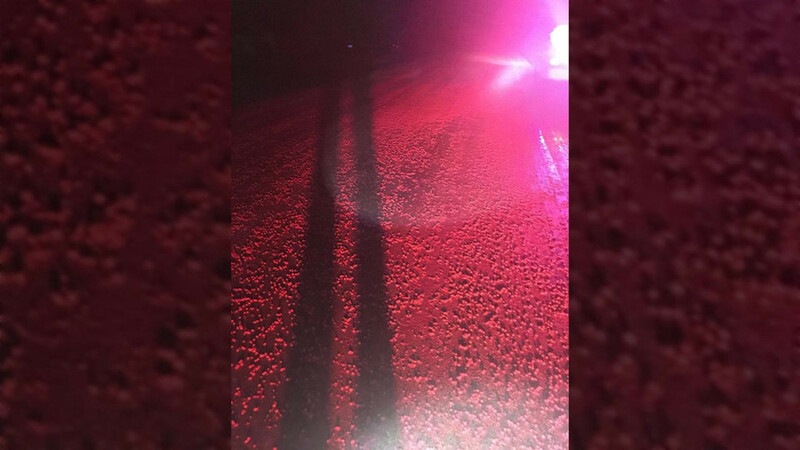 A large box of red skittles on the back of a flatbed truck emptied itself onto a Wisconsin highway during a rainstorm, which was every bit as delightfully bloody looking as it sounds. Oddly enough, the candies were to be used as cattle feed because they weren’t deemed good enough for packaging. In March 2011 a UPS truck did a Banksy in Massachusetts when it overturned, spreading 16,000 pounds worth of ink cartridges – and much of the colorful contents – all over the highway. InkCloners on YouTube covered the crash, which was certainly colorful but not particularly harmful since the ink was water soluble. However, it snarled traffic in the area for hours until it was cleaned up. This time, the culprit isn’t a truck but a family traveling through in West Virginia that we covered way back in 2013. 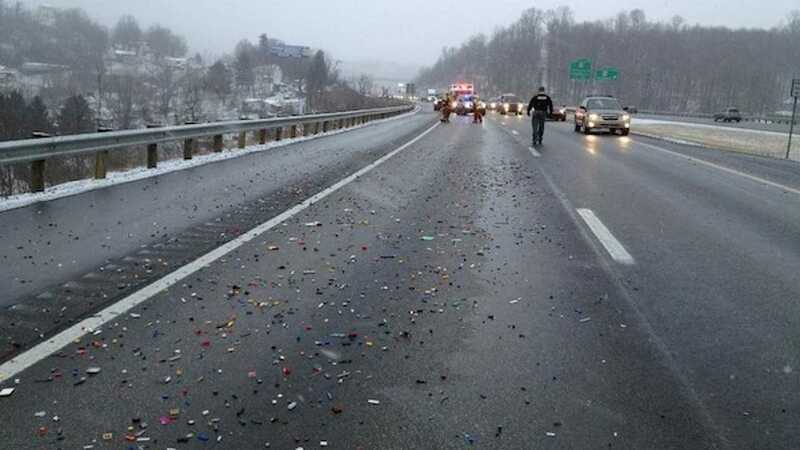 Totes of Legos strapped to the roof of a Dodge Durango came loose, spilling the bricks across the highway. 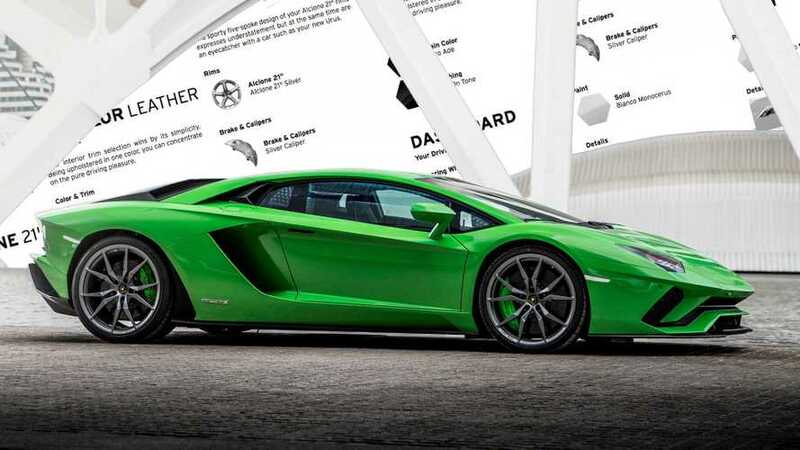 It’s bad enough trying to walk on errant bricks – a large pile on a highway could be quite a traffic hazard. While not necessarily as disgusting as some other food-based spills, can you imagine the slippery mess this would cause? This has happened a few times, including a nasty spill back in 2012 covered by WLFI News and posted on YouTube. 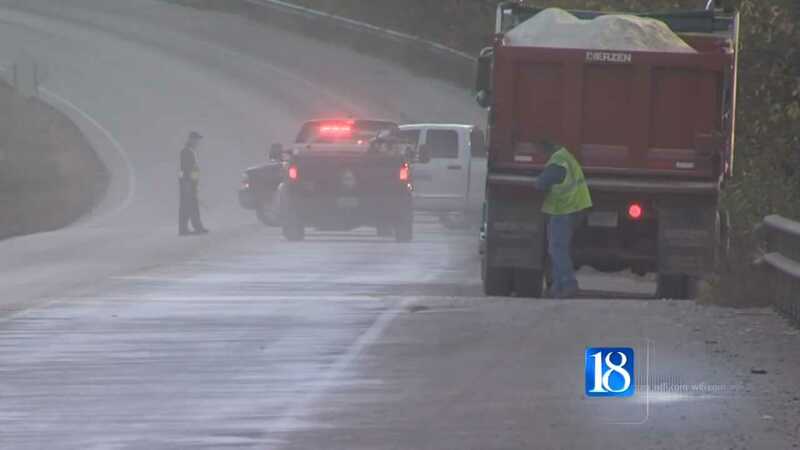 It doesn't look that bad, but the spill covered 26 miles of highway in Indiana and it took days to clean up. 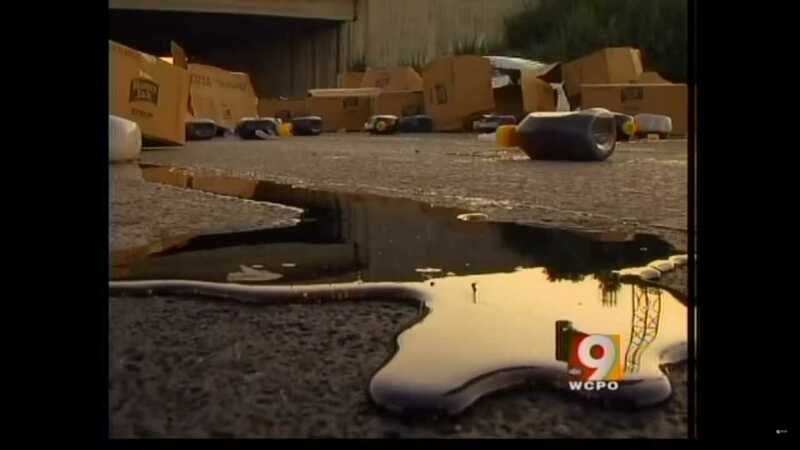 From slippery to sticky, hundreds of bottles of maple syrup spilled in Kentucky back in 2012 as covered by WCPO.com on YouTube. We'll spare you the pain of punning about sticky situations, but we're absolutely forced to tell you this crash took place on I-75 at Buttermilk Pike. The truck hit the pillars of the overpass, which split the trailer open and scattered the syrup across the highway. This isn’t anywhere near as disgusting as slime eels or sardines, but the visuals are straight from a bad horror movie. 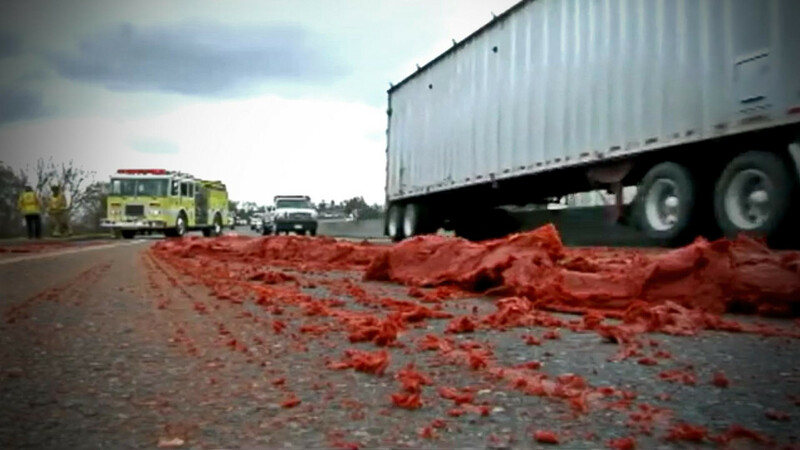 This particular spill stems from 2010 when a bunch of tomato paste broke loose on a flatbed truck in Ceres, California, about 50 miles east of San Francisco. 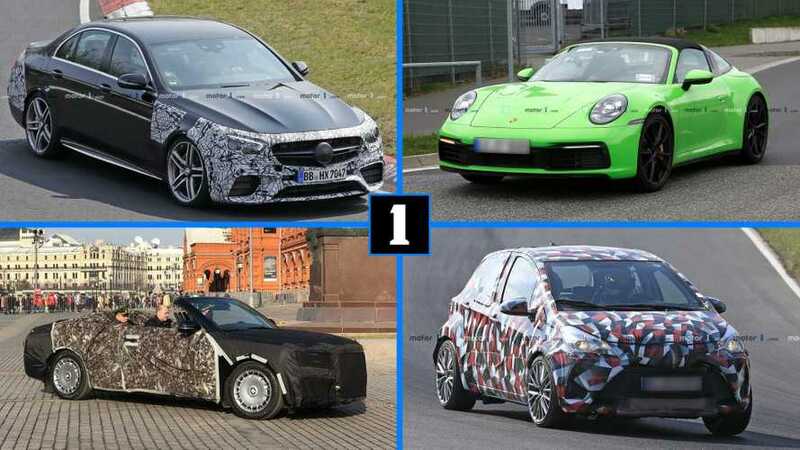 At least now we know what to use for special effects at our Halloween car show. 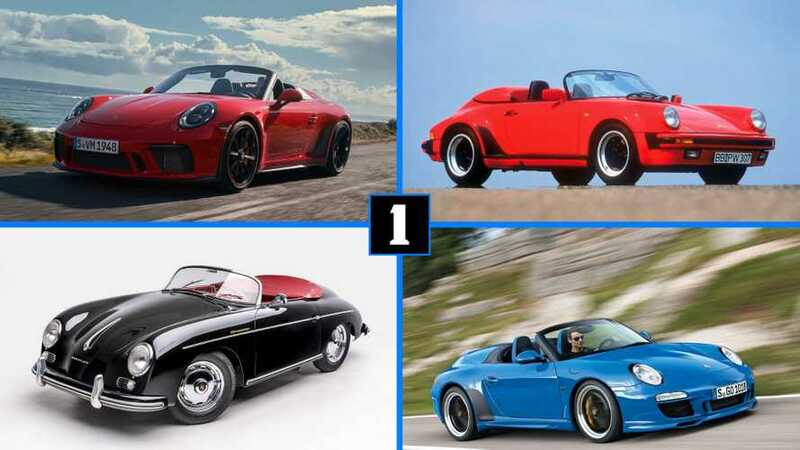 Deadpool? As in the awesomely R-rated crime fighter? That’s right, and it even happened in February 2016 just days after the movie came out. 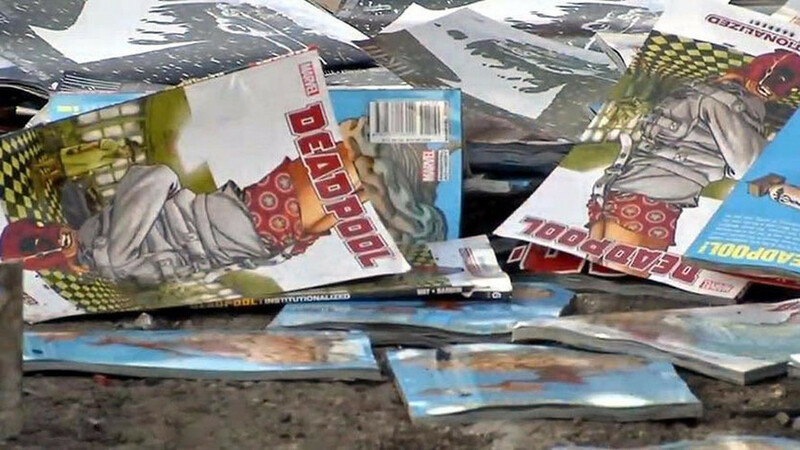 According to cbr.com the truck carrying the comics – which did include other titles – was broke down on the side of the road when another truck hit it. We can’t confirm who was driving that second truck, but considering the timing of crash with the movie release, it sure sounds like something Deadpool would do. Warning: milk puns forthcoming. 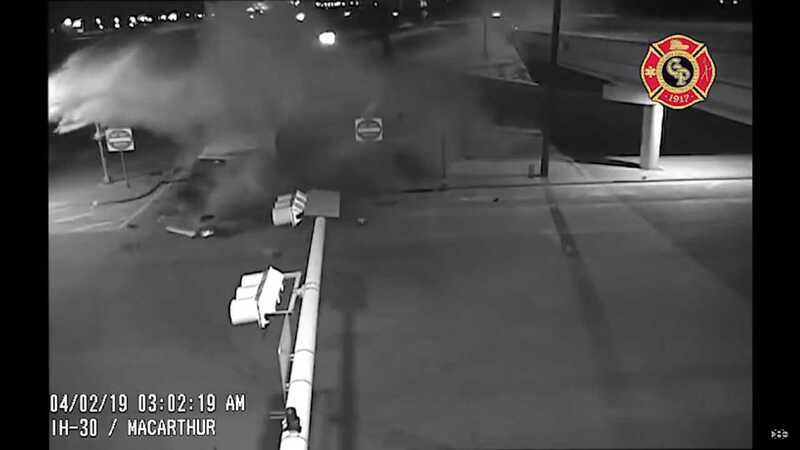 The driver of this truck, who presumably is also lactose intolerant, suffered just minor abrasions when he fell asleep behind the wheel and crashed off a highway overpass. The early morning trip was supposed to be a milk run, but unconfirmed rumors say the driver was ultimately crying his eye out over spilling so much dairy across the road. Printer ink is the only item making a second appearance on this list, only this crash wasn’t as colorful as the previous one. 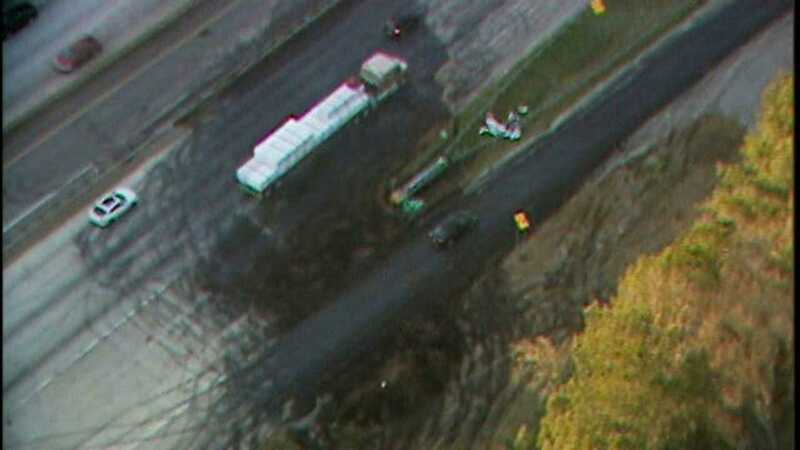 Nobody was injured when a motorist cut off this semi-truck on a highway near Atlanta in March 2019, but the ignorant maneuver caused the truck to crash and ultimately dump 40,000 pounds of black ink across the highway. Honestly, from an aerial perspective, it looks like one of Ken Block’s tire-slaying stops from Gymkhana 10. Having a bad day? It could be worse. Folks, trucking isn’t easy. 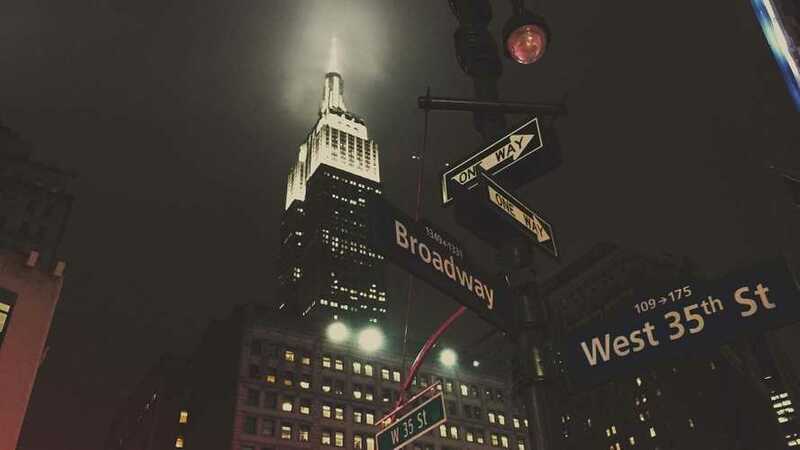 Those of us not living the highway life completely take these road warriors for granted. 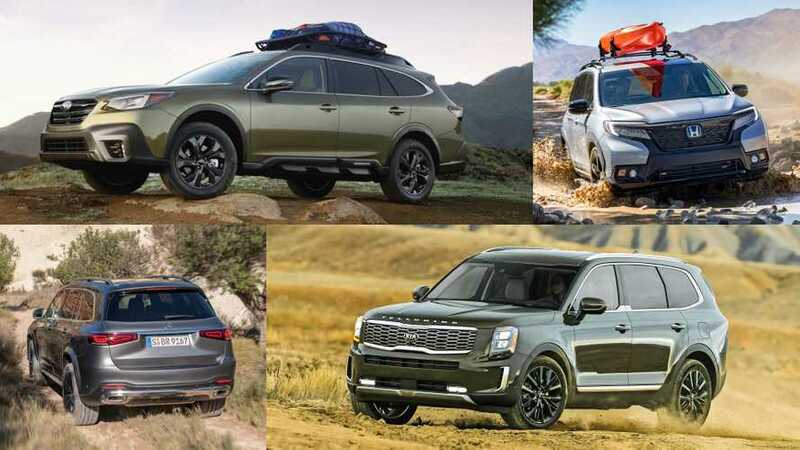 Then something like the recent chocolate spill in Germany reminds us of the varying kinds of cargo traveling the world's highways and byways. 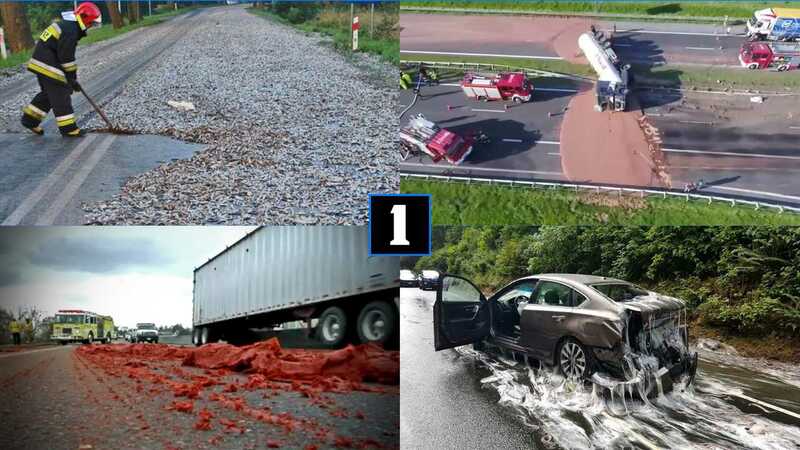 While the vast majority of goods safely reach their destination, accidents do happen and the aftermath can sometimes be interesting, to say the least. 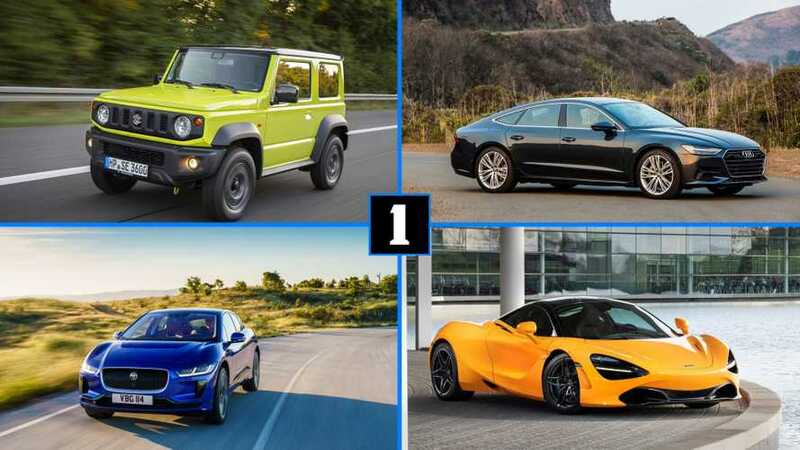 From humorous to just plain gross and surprisingly scientific, here are a few of our picks for some crazy highway spills.